The administration of Gov. 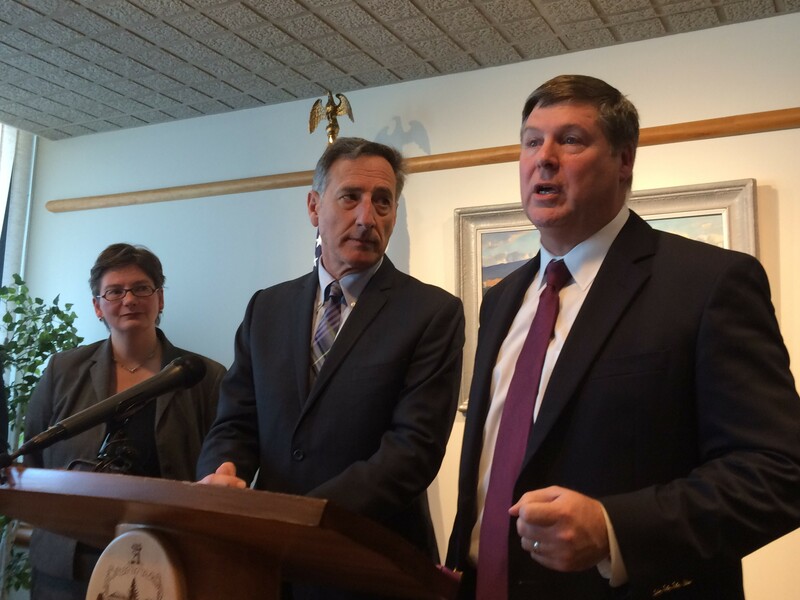 Peter Shumlin and the quasi-independent Green Mountain Care Board laid out the framework Monday of their joint negotiations with the federal government for a waiver that would allow the state to promote a new and fundamentally different payment system for health care. The state needs federal permission because two of the health insurance systems it wants to involve are federal programs — Medicare and Medicaid, which respectively cover the elderly and the poor. The state wants change to include commercial insurance, too. The state is proposing to move from the current health care model that pays a fee for a service such as a blood test or a physical exam. In the new system, hospitals and doctors would receive set payments for their patient populations and have flexibility to provide appropriate medical care to prevent or manage patient health. The precise payment methodology has yet to be determined. Monday’s briefing, featuring Gov. Peter Shumlin and Al Gobeille, chair of the Green Mountain Care Board, coincided with the state’s submission of preliminary terms and conditions for the waiver from federal regulations that Vermont seeks. The board, the Shumlin administration, and the Centers for Medicare and Medicaid Services have been talking about the so-called "all-payer waiver" for a year. The target to start operating under the new system is next January, which would require an agreement by late spring. His use of the word “invent” worried Darcie Johnston, founder of Vermonters for Health Care Freedom and an opponent of this and other Shumlin health care initiatives. She attended the briefing. Guy Page of the Vermont Alliance for Ethical Health Care, who also attended the briefing, said the new payment system would focus on preventive care. He worried about how very sick people would be treated under this scheme. The board and the administration intend to gather broad reaction to the proposal in the coming weeks before submitting a final version of the terms, Gobeille said. The deal that the state hopes to secure would run for five years, starting next January. The state is suggesting that under this new payment system, it would try to hold health care spending growth to an average of 3.5 percent over the term of the agreement. It would commit to an average maximum growth of 4.3 percent. The state also suggests it would try to attain three health improvement goals during the term of the agreement: increased access to primary care; reduction in the prevalence of chronic diseases as well as improved management of those diseases; and progress in addressing the substance abuse surge. The governor repeated assurances he made in his budget speech last week that under an all-payer waiver, Vermonters would continue to choose their own doctors, and that the benefits provided to Medicare recipients would, if anything, expand. “For Vermonters, our innovation will mean not only a health care system that is more affordable, but one that better meets their needs,” Shumlin said.